Sometimes you have to go back (to move forward). | Life. Realized. Each year I come to expect the hubbub that is the first quarter. It's Mario busiest travel season by far, and January and February are, well, January and February. We dragged our tanned, salty hides home. I took my state certifying exam (I passed! ), and we began settling back into post-vacation life. Mario (finally) made the transition into his new position, with its significantly reduced travel schedule, and I began contemplating the very real prospect of rejoining the workforce. I'd almost completely unpacked from our trip and was on schedule to break a personal record for fewest days spent with a lingering suitcase on my bedroom floor. Then I got a call. You know the type: the calls that inevitably come but we are seldom prepared for. A person from my past, someone integral to my childhood, had passed away suddenly and unexpectedly. So I (re)packed a bag and hopped a plane to Montana late last week. Although saying goodbye is never an easy thing, this was particularly complicated. It meant the reuniting of siblings and unfamiliar people I had never met but with whom I was very much connected. The dynamic of my family is an emotional labyrinth; I never leave these things unscathed. I am one of four children, and we all cope in vastly different ways. The heartache and healing I experienced in a matter of just a few days was profound. Anger, sadness, guilt, regret, despair... I ran the emotional gamut. Sometimes we are forced to access those pockets of emotion we've long since buried; to crack them open and deal with issues we thought were no longer issues. I have been known to mistake the softening that comes with the passage of time as reconciliation, though they are not one and the same. Wading through the murky waters of emotion, especially involving family and one's own childhood, is rarely easy. But we are usually better for it. Entering into 2015, I wasn't anticipating so many of life's natural complexities to occur so soon or in such rapid succession. I suppose that's the beauty of things: we don't get an advanced screening of our own lives. Now I'm on the other side. March has brought newness and healing and cherry blossoms. After years spent living in New England, I'd long since forgotten that spring actually occurs in spring. 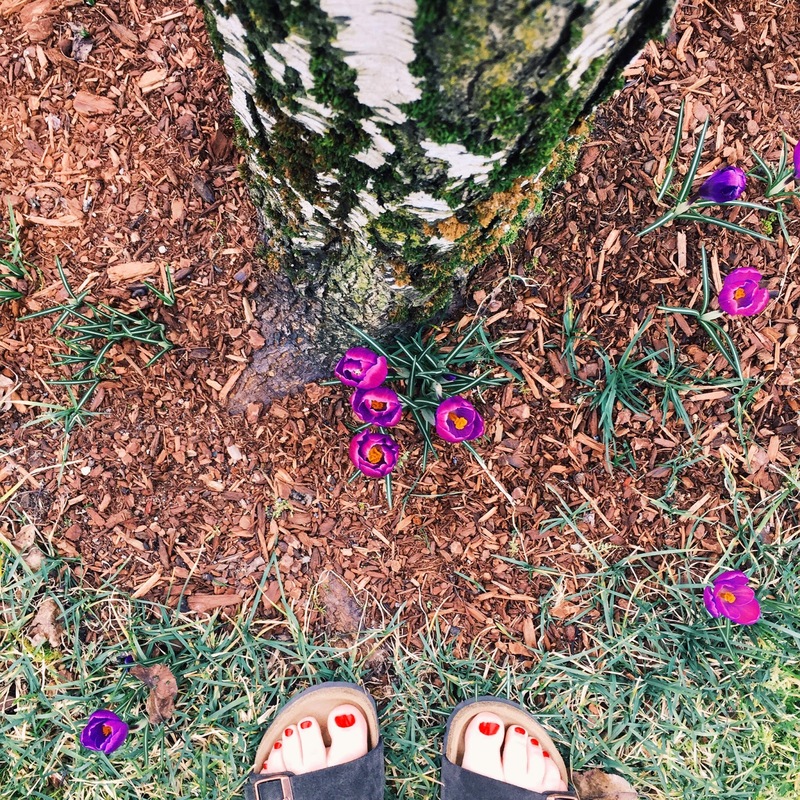 Tulips, in the loveliest shade of purple, are budding around the tree in our front yard. An urgent call to a landscaper was made upon the discovery that our rose bushes and hydrangeas had already birthed baby leaves and would have consumed the house by June had we not intervened. Kiddo had his first track practice yesterday (sprinting + pole vault are his chosen disciplines; breath holding during vaulting practice is mine). Husband is wearing shorts (a Montana boy through and through, that one; he comes from hardy stock). This is the first spring in a long time that feels like the dawn of something new. This time last year our move was still months away and we had not had a single house showing since we'd listed it the previous September. This year there is no holding pattern. No what ifs. No uncertainty outside those inherent to life as human beings. For the first time in ages, are absolutely where we want to be. We are settled and secure; content. And better for having to jump some hurdles to get there. I'm sorry about your loss but so glad that you are content where you are. That can make all the difference in the world. Thank you, Jen! Things tend to work out in the end... and we seem to be living proof. :) Hope all is well with you! about damn time you came back.....been worried sick about ya!! sorry for the loss but maybe thankful for the reflections? in Dominican Republic typing this with poor connections.....write about your trip, plz. Cant wait to see images!